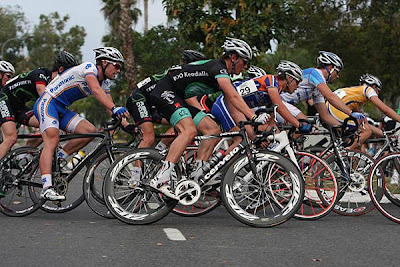 The Bay Crit series is set up for spectators – not for the racers. Along with this comes lots of hot dog circuits and tight corners around round-abouts. You need to slow down from 55km/hr to 15km/hr coming into these corners and then accelerate out of them again. For the people at the front this is difficult and painful, but for the people past the top 20 (23 I believe is the magic number) it is absolutely excruciating. If you’re anywhere outside of the top 23, you can see the riders accelerating to 55km/hr out of the corner before you’ve even entered it! You have no chance if you’re near the back. It’s easier said than done, but you NEED to be in the top 20 if you’re going to last until the end. The accordian effect is worse the further back you are. If you’re outside that top 20 you actually need to be hitting FASTER speeds than the riders at the front. This is because you are slowing down to lower speeds and you need to ramp back up to faster speeds to catch up again. One TIP for these types of races where you can’t carry your speed through the corners is to use those corners very wisely . You can either take an inside line or and outside line through these tight hairpin corners. Inside line: taking the inside line will allow you to make up 5 – 7 places in your position. The drawback to this is that you’ll need to reduce your speed a lot more in order to take this tight line. You’ll need to sprint much harder to get up to speed coming out of the corner and then you’re completely shattered in 30 seconds. Use this sparingly and only when you need to make up positions. Outside line: taking the furthest outside line is by far the most efficient. It allows you to carry more speed through the corner and you won’t need to sprint as hard out of it. You may get passed by some people taking the inside line, but as I said above, they’ll be killing themselves trying to keep this going for long. TIP : carve your tires into the pavement when taking these lines at speed by putting a lof of weight on your outside pedal (at it’s 6 oclock downward position). You won’t be pedaling through these corners because it’s far too tight. Doing this will keep your weight down on top of the bike for the best traction on the road possible. I’m glad I’m watching these crits this year instead of racing them. I cannot stress how difficult they are. Usually only 40 out of up to 100 finish each race. I definitely have moments where I wish I was taking part, but then I take a sip of my beer and give my head a shake!